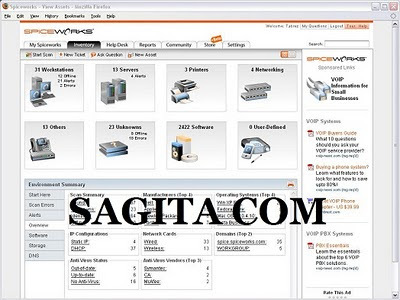 Spiceworks TI Desktop adalah aplikasi yang menggabungkan Inventarisasi Jaringan, Help Desk, Pelaporan, built-in TFTP Server, Pengawasan, Manajemen Active Directory, dan Pemecahan Masalah dalam antarmuka tunggal yang mudah digunakan yang dirancang untuk tim IT dan bisnis menengah. Spiceworks memungkinkan Anda berkolaborasi dengan IT pro di seluruh dunia untuk memecahkan masalah. # Discover the Windows, Mac, and Linux PCs and servers, routers, printers and any other IP-based devices on your network. # Gather all of their relevant technical data plus the software, patches and services on each machine. # Add important data such as the number of licenses you have, the purchase price and physical location. # Keep track of other assets such as mobile phones and even office furniture. All without agents. # Store all inventory information locally and securely on your network - so there's no concern about sensitive data flying across the Internet. # See and set up alerts for Windows events that occur across your environment - so you can easily detect, diagnose and troubleshoot issues that disrupt your network. # Automatically identify PCs and servers with low disk space, the presence of unwanted software on your network, the status of your anti-virus updates, printers with low toner and ink levels, and offline servers. # Receive email alerts about potential issues. # View all the monitors you care most about in one centralized spot. # With one-click, see software installed on your machines, disk usage across the network, trouble tickets you've created in the past month, and much more. # Create the custom reports you need with a simple interface. # Publish reports so others in your company can stay in the loop. # Export any report to PDF and Excel. # Exchange useful report templates with other Spiceworks users. # See what software is on a machine that is causing it to run slowly. # Launch your remote control tool from within Spiceworks. # Compare two machines to see what settings are different. # Ping machines to see if they are online. # See traceroutes to identify the flow of data. # Identify when a server is running out of capacity.